In 1921, a manuscript dating to the late 15th or early 16th century was donated to the National Library of Wales. It was a “passional”, a book recounting the sufferings of saints and martyrs, and containted 2 texts in medieval French: “La Passion de Nostre Seigneur” (The Passion of Our Lord), an account of the Passion of Christ, and “Le miroir de la mort” (The mirror of death), a religious poem by the Burgundian chronicler Georges Chastellain. The book had once been owned by Lady Joan Guildford (c. 1463-1538), nee Vaux, who served in the household of Elizabeth of York as governess to the princesses Margaret and Mary Tudor, but it remained relatively obscure until 2012 when it was scanned to make it available on the internet. 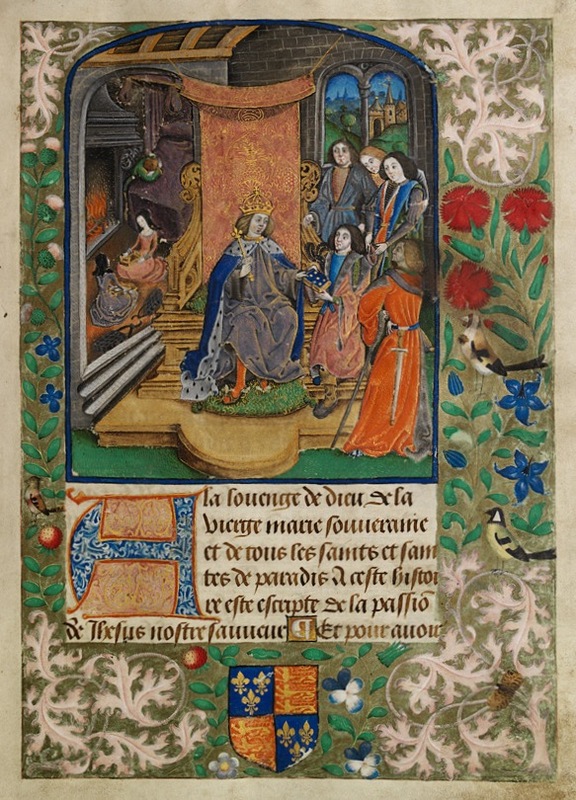 When Dr Maredudd ap Huw, the library’s manuscripts librarian, examined the first miniature in the book as part of the digitisation project, he realised that it showed the family of Henry VII, including the future Henry VIII, mourning the death of his queen, Elizabeth of York (1466-1503). Young Henry, who is shown slumped over his mother’s empty bed, was 11 years old at the time of her death, making this the earliest known depiction of him and certainly the most vulnerable. Also present are his sisters Margaret and Mary, dressed in mourning black, while the sovereign in the centre of the miniature appears to be an idealised version of their father, Henry VII. The bottom of the page bears the royal arms of England. Dr ap Huw’s discovery catapulted the Vaux Passional to fame, but while the persons on the left of the miniature were now identified, the those on the right remained shrouded in mystery. Most mysterious of all was the man at the centre who is handing a book to the king – so much so that Dr ap Huw appealed to fellow historians and even members of the public for suggestions who he could be. Unfortunately, the response was muted and today – more than 2 years later – he remains officially unidentified. Why is he so mysterious? At first glance, the scene appears to be a typical “presentation miniature”, showing the author or person who commissioned the book – in this case the passional – presenting it to his patron. It was therefore initially assumed that the book had been part of the royal library of Henry VII before passing into Lady Guildford’s possession. Since both texts contained within the book had been published before, the mystery man can’t be the author. He therefore would have to be the person who commissioned the book, so who is he? He is unlikely to be Sir Richard Guildford, who has been tentatively identified by Dr ap Huw as the man in the foreground holding the white wand of the office of Comptroller, an office he held under Henry VII. The book bears an inscription by Lady Guildford’s son, Sir Henry Guildford, but he was only 14 years old at the time of queen Elizabeth’s death and her brother was serving as Lieutenant of Guînes. Dr ap Huw had hoped that the arms on other pages of the manuscript would help to identify him, but they were found to point to the maternal ancestors of Lady Guildford, except those on the page depicting Christ’s resurrection, which are the arms of the Beaufort family. This led Dr ap Huw to consider the possibility that the book had not been commissioned for Henry VII, but for Lady Guildford – in which case the scene is not a presentation miniature. There are a number of other clues which support this conclusion. In presentation miniatures the person presenting the book is usually shown kneeling, but the mystery man is standing. The composition places him on roughly the same floor level as the king and his facial expression and body language are relaxed and confident: he looks more like an equal than a subject paying tribute to his sovereign. Last but not least, the book in the picture is blue while the passional is bound in red velvet which, according to the library’s website, is the original binding. So if this is not a presentation miniature and the mystery man therefore not the person who commissioned the book, who is he? Unlikely as it may seem in this context, he looks remarkably like Henry’s predecessor, Richard III. The hair style, texture and colour as well as facial features – prominent chin, down turned corners of the mouth and furrowed brow – are similar to Richard’s portraits from the Tudor period. These were created based on a pattern which the miniature seems to broadly follow: allowing for the cartoonish style, the 3/4 perspective, facial features and frown line between his eye brows line up remarkably well. The clothing, position of the hands and facial expression are different, but he certainly looks more like Richard III than the idealised sovereign looks like Henry VII. Finally, we could stop looking for a coat of arms to identify him by as it would be right on this page: the royal arms of England. So could this be Richard? At first glance, it seems unlikely. There’s no known precedent for depictions of a dead king presenting a book to his living political enemy and the Guildfords were by all accounts staunch Lancastrians. Lady Guildford was the daughter of Katherine Vaux, nee Peniston, who served as lady-in-waiting to Margaret of Anjou and was so loyal to her mistress that she is said to have shared her imprisonment and exile. Young Joan and her brother Nicholas were brought up in the household of Henry VII’s mother, Margaret Beaufort, and Joan went on to become her lady-in-waiting. Nicholas is thought to have fought for Henry at Bosworth as he later did at Blackheath and Stoke, for which he was knighted. Lady Guildford’s husband, Sir Richard Guildford, was the son of Sir John Guildford, who had been Comptroller of the Household to Edward IV. Both father and son took part in Buckingham’s rebellion against Richard and when it failed Sir Richard joined Henry in exile in Brittany. Like his brother-in-law, he is thought to have fought for him at Bosworth. However, Lady Guildford also had Yorkist connections. Her brother’s first wife was Elizabeth FitzHugh, daughter of Sir Henry FitzHugh and Alice Neville, niece of Cecily, duchess of York and aunt to Anne Neville, Richard’s queen. Both Elizabeth and her mother had served Queen Anne as ladies-in-waiting and her sister Anne FitzHugh was the wife of Richard’s best friend, Francis Lovell. Despite her devotion to Margaret of Anjou, Lady Guildford’s mother received an annuity of 20 marks from Richard, the same amount as later from Henry VIII. And most obviously, Lady Guildford herself served in the household of Elizabeth of York, daughter of Edward IV and Richard’s niece. I held the British kingdoms in trust, [although] they were disunited. Another version of the epitaph is more critical of Richard, but both describe the transfer of power from him to Henry in equally amicable terms. Is this the scene depicted in the miniature? The linking of the Beaufort arms to the resurrection of Christ appears to send a similar message: the restoration of the “red rose” of Lancaster to its rightful place on the throne of England. Is the book in the miniature then not a physical book, but a symbol? That would explain why it doesn’t look like the passional. So what if this is Richard? It would be one of his oldest surviving depictions aside from coins and pen-and-ink sketches (the oldest portraits in the Society of Antiquaries and the Royal Collection date from around 1504-1520) and the only one showing him smiling. Given that the image of the “crookback” king had been around since at least the 1490s and by the time the Royal Collection portrait was created his paintings were being actively “corrected”, it would also be unusual in that it shows him without deformities. Is this perhaps how he was remembered in the household of Elizabeth of York where Lady Guildford served as governess? Elizabeth had spent time at her uncle’s court and would have known that his scoliosis was not visible under normal circumstances (see Bones Don’t Lie). The exact nature of the relationship between Richard and his niece is unclear. It is highly unlikely that he wanted to marry her – he publicly denied the rumour and was negotiating a foreign marriage – but they seem to have been on friendly terms. One source for this is Elizabeth’s letter to John Howard, duke of Norfolk, in which she declared that her uncle “was her onely joy and maker in…Worlde, and that she was his…harte, in thoughts, in…and in all.” The original letter doesn’t survive, so we can’t be sure how accurately its content was summarised and the summary itself is damaged, but the tone is clear. Richard also appears to have given her 2 books as gifts. The first, Boethius’ “De Consolatione Philosophiae”, bears his motto “Loyalte me lye” and underneath it her signature. The other, “Roman de Tristan”, is inscribed “Iste Liber constat Ricardo Duci Gloucestre” and on the same page in her handwriting “sans remevyr Elyzabeth”. 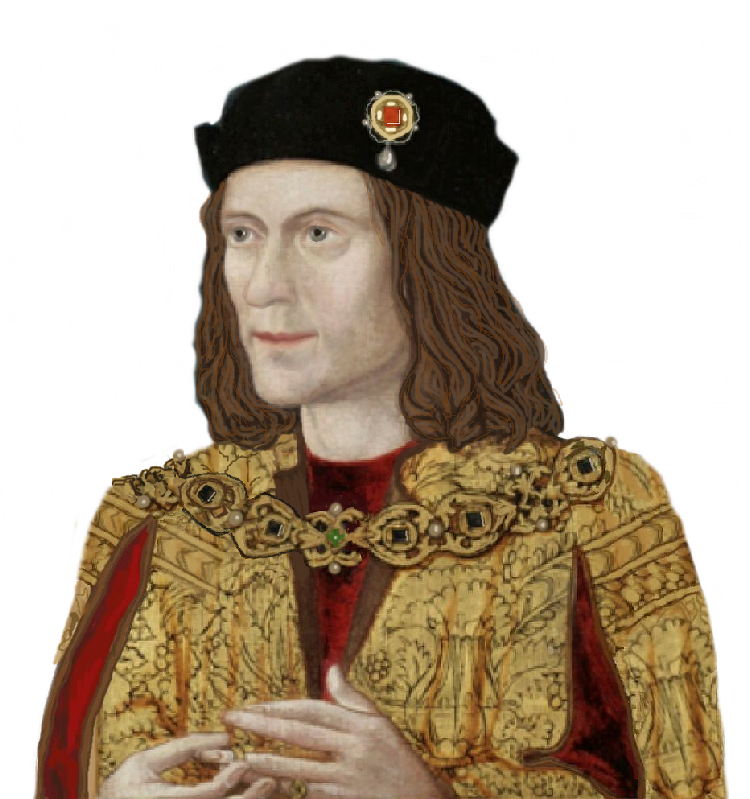 Emily Kearns: “Richard III’s Epitaph”, The Ricardian Vol. XXIV 2014, p.75-86.